I know you don't have to wait for a certain time of the year to have a clear-out but there's something about the lighter evenings that makes me feel more productive when I get home from work. Also, I know I'll be moving house in September so streamlining my stash is going to be at the back of my mind over the next few months. Today I'm going to share my top tips for clearing out your stash and narrowing it down. I've pretty much decided that when I move out I want my entire collection to fit in 3 x 5-drawer Muji boxes and 3 x wide 2-drawer Muji box (you can check out their acrylic storage offerings here). My idea is to trial just having the products I'm taking with me and see if there's anything I miss much - then when I come home at Christmas I'll have had a good chance to assess what I need and what can go (to whittle it down more than I already have). I think you need to start by visualising how much stuff you think is reasonable. One of the things I've also found helpful for saving space and using products more is de-potting them. If you have 10 single eyeshadows you really like but they take up an entire drawer and you often forget to reach for them then you should definitely consider de-potting. All you need is some heat (like hair straighteners), a pair of scissors or tweezers and a magnetic palette to condense them down into much less space. If you've got a pretty big collection it can be a little overwhelming to try and tackle it all. I suggest instead first narrowing it down to the products you really love and definitely want to keep, as that's a much easier job (we'll deal with the rest later!) I'm not saying anything as extreme as one item per category (it totally depends on the size of your stash though) but just your favourite products you find yourself reaching for all the time. A good rule of thumb if you're struggling is to also make sure it's a product you've used in the last month. What do you 'need for the blog'? There are always going to be a few products you feel you have to keep hold of to reference in your blog posts. Whether it's a dried-out mascara you still want to be able to mention but aren't going to repurchase just yet or a super-hyped foundation you need to talk about how much you hate or the amazing dupe you want to be able to suggest; we probably all have these kinds of products. Set them to one side and we'll come back to this later. These are the products that maybe you've not used in the last month but you do still really like, they're just maybe something you wouldn't wear right now. Maybe it's the full-coverage foundation you only wear for nights out or the really deep, vampy winter lip colour or that neon eyeshadow palette you picked up for Halloween. If you can't see yourself wearing it even when the time comes then get rid of it - if you still love it then it can go in the 'keep' pile. If you're not quite sure then add it to your 'last chance' pile. That green eyeshadow you really thought you'd make work for you. The foundation that's completely the wrong colour. That lipstick that totally washes you out. The mascara that makes your lashes look short and clumpy. You get the picture! These are the products that didn't quite work for you and for whatever reason are still knocking about. Maybe they're products you loved at the time but your tastes have changed. These products should all go in the 'pass on' pile. These are the products that you bought and kind of forgot about, never gave a real chance or maybe they're even still sat unopened! They're the products that have potential and now it's time to put them to the test (which we'll come to later). I've rediscovered so many products that have gained a new lease of life through this method. Ok - now it's time to get organised! I like to keep my everyday makeup in a set of 2 large Muji drawers - you can totally use a makeup bag and still do this, I just find it easier to see what I have when I use acrylic storage. I switch this up every week and make sure I have a balance in there of everyday staples, new products I'm testing and products I want to get more use out of. This is where your 'last chance saloon' products come in - test each product and give it a proper chance for a week and at the end of the week, when it's time to rotate everything round, decide whether to keep it or add it to the 'pass on' pile. This is also a great way of making sure you're using your full collection. Personally I like to keep a separate section in my storage for any products I've kindly been gifted but haven't yet photographed. I also have a separate drawer for any free samples, sachets and testers I save for when I travel. 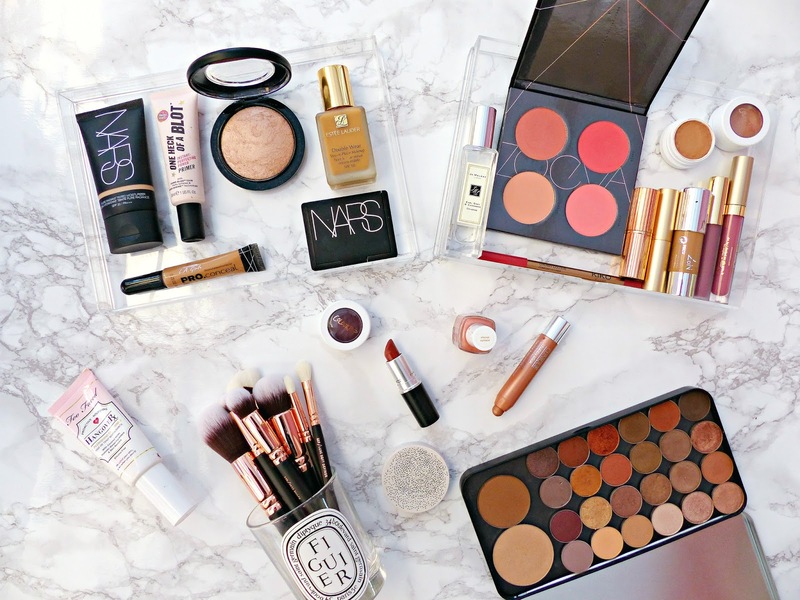 Now it's time to return to those 'need it for the blog' products - I'd also advise keeping those out of your main makeup collection to reduce clutter and you can just go back to them as and when you need them. Then you'll also remember to throw them out when you re-purchase any of them. It's time to go back to your maybe piles with those 'last chance' and 'occasion' products and get swatching. See if any of the products are similar to each other or to products that are in your definite 'keep' pile. If they are then ask yourself if you really need both! Anything you have duplicates of - pick your favourite and leave the other in the 'things to pass on' pile. Now it's time to start getting rid of stuff! If you're in need of cash and want your products to go to a better home then have a blog sale! Obviously don't include stuff that no one in their right mind would want to buy and consider if it's really worth trekking to the Post Office to send a lipstick you sold for 99p. If you have unused and unopened products then you can donate them to women's charities. The most high-profile one that I know of in the UK is Give and Makeup however there may also be local organisations in your area. If all else fails then you can always pass things on to friends and family who will probably appreciate it! The old and expired products of course need to just go in the bin - along with anything else that's not really worth selling or not in a nice enough condition to give away. I haven't really covered off skincare and body care products in this post but this can apply equally to them as it can to makeup. Even if you like all of them; you probably don't need 3 liquid concealers on the go at the same time that you use in the same way and have a similar finish! Put one of them (with the least left in it) into your everyday makeup rotation until it's used up and then replace it with the next to be finished and continue. This will cut down on space taken up with half-used products. There you have it: my process and advice for cleaning out and streamlining your makeup collection! Will you be having a Beauty Spring Clean? What are your top tips? Loved this! Great advice! I should really clean out my makeup stash! p.s. I love the picture!! This is such a helpful blog post! I love a good bit of organisation & your tips are so helpful :) I've been trying to condense my makeup collection recently & I've been doing a little trial to see which products sit in my makeup bag but don't actually get used; if they've been sitting in there for a couple of weeks unused then I move them to my blogging box underneath my bed instead and give them a couple of months in there to be featured in a blog post before I'll give them away. Now I really want to take a look at your makeup collection! I think rather than the usual problem of 'too much' products that people have, I have more difficulties in throwing away empty products because of this weird, sentimental feeling I have for them. I cleared mine out a few weeks ago and got rid of quite a lot. It's nice to de clutter makeup as you find products you forgot you had! Your makeup collection seems amazing! I need to sort out my makeup because it's so unorganized at the minute, I definitely have storage issues! I don't really follow the expired rules either, I can definitely get better when it comes to get rid of the products which aren't for me though, I guess I just like to look at them even though they don't look as beautiful once I wear them! I clear things out and then buy more oops! This is such a useful post! Im the sort of person who will live for a few products, but in the mean time I will also buy anything that is hyped up on youtube, use it once or twice, and then forget about it. I have drawers and drawers full of make up I really need to have a good sort through! I'd love to see your collection once you've streamlined it! I have found this post so useful. I love a good makeup purge, I do it a couple of times a year and pass on everything that isn't expired to my mum (so she loves them, too). One thing I'm not very good at is actually using up everything I've got! I really need to work on that! I definitely need to apply some of these tips to my makeup stash which is in desperate need of a spring clean out haha! I struggle with the "what I really love" part. I love it all!! But I did do a bit of a spring clean and got rid of anything that was out of date, I hadn't used in 6 months or didn't suit me anymore. I was hard, but freeing! after reading this, I seriously need a clear out! I really need to do this. I am such a hoarder so no tips from me haha I rotate from my most used which sit on my desk to stupid things I don't use that sit in a makeup bag, really need to start passing things on to younger cousins! I really need to clear out my stash, but I just love looking at all those pretties. These are some helpful tips, thanks for sharing. I use to be good at decluttering my makeup but Im not so good nowadays. I really need to organise my collection though, its a disaster right now. Haha! After finals I definitely need to go through my stash and do this! I'm all out of space on my vanity. wow! I am already so obsessed with your blog - so happy I found it!! Beauty bloggers must stick together! I am so ruthless when it comes to getting rid of products. I hate feeling like I have things I don't use, I put little stickers on things and if I haven't used (and removed the sticker) something in 3-6 months it goes! I think once you have a good approach to binning things it also controls your spending too - cause no one likes binning money! Such a helpful post. I had a clear out not too long ago but I wasn't that ruthless, especially when it comes to expiry dates. I wouldn't dream of throwing away a blusher after 2 years!! Think I might need to have another go and this time actually get rid of stuff! I go through my stash regularly and give things away that I'm not using. I hate being wasteful, it really bothers me, even with makeup! This was such a good post, really helped me realize that I do actually need to go through my make-up and have a stern talk to myself as to what products I do and don't need. The ones I don't use I normally give to friends and family and they get better use out of them than me! This was such a helpful post! I definitely keep things longer than the expiry but like you said - if they look and smell fine, I'm sure they will be fine (within reason, of course)!